Enjoy three days of exploring on foot through dramatic, unspoiled landscapes on this short break self guided walking holiday in Cyprus. Walk through the unique Troodos region of central Cyprus, hiking through pine and juniper forests, towered over by rugged mountains to discover pretty lakes, waterfalls, ancient churches and streams that you can cool your feet in. There are numerous trails to walk, with the Artemis and Madari Trails highly recommended. There is also the option to walk on the Persephone Trail, the Caledonia Waterfalls Trail and enjoy a hike to a beautiful lake. For fit walkers who enjoy a more demanding hike, there’s also the Kannoures Trail. The walks can be extended or shortened, so there is lots of flexibility on this break and you can pick routes to suit you. 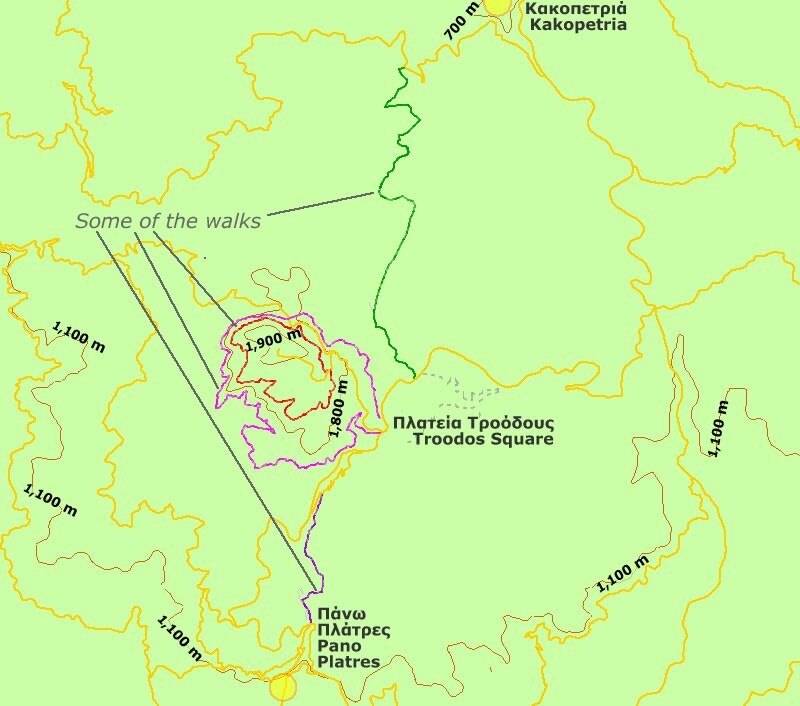 Choose to do a short six kilometre (four mile) walk on the Persephone Trail, or shorten the Madari circular walk to eight kilometres (five miles). Longer walks of more than 15km (nine miles) are also possible, by combining walking to the Amiantos Lake and then returning via the Kannoures Trail. The walks range from 1,000m elevation to 2,000m and we provide maps and GPS data are provided. Your base for this short break is the pretty stone village of Kakopetria, home to an olive and grape press, a watermill and a walking trail by a stream. You can also visit one of the UNESCO World Heritage Troodos painted churches. It’s a good idea to add on an extra day or two, as well, so you can walk more or take the public bus to visit Nicosia. Wildlife: One of our projects to protect the environment is in the form of a reforestation experiment in Xeros Potamos Valley on private land (7 hectares). The experiment has a long history (it started in the late 90s), but the main actions took places in 2006 when we planted 3,000 saplings mostly of wild olives as well as of hawthorn (also some oaks, pines and cypresses), two plants that are found in the area and are suitable for dry climatic conditions. 1,000 trees survived only to perish through a wildfire in 2013. The vast majority of the young trees grew new shoots in the years after the fire, so we are confident that the experiment is successful. We envision developing the experiment into an environmentally friendly agrotouristic refuge, where travellers would be able to engage in agricultural work with regards to olives, hawthorn, vine and herbs cultivation, have a base for exploration of the beautiful area of Xeros Potamos Valley and a refuge inside nature away from busy cities or resorts. We like to discuss this project with travellers, especially on the trip from the airport to the accommodation. Where possible, we design our travel packages with the intention of enriching our clients experience by taking them through places where it is possible (but never certain) that they will spot very local wildlife. The specific package takes the traveller to a variety of habitats at various altitudes and provides the opportunity to see varied flora and fauna including a number of endemic species found only on Troodos. It is a package that is offered (also) throughout summer, in an area of Cyprus that is particularly greener with relation to the rest of the island in summer. A good number of flowers are in blossom on Troodos in summer, including wild roses in June. Transportation: We aim to minimise as much as possible the use of transportation on our trip because this would be in the interest of the environment in general and of our clients in particular since this is reflected in a lowering in the price of the package. We encourage our clients to use local public transportation as much as possible and we use local taxi when public transportation is not efficient or non-existent. Accommodation is in a relatively small locally owned establishment in old Kakopetria village. We do not include dinner even though it would probably be a bit cheaper for the traveller. We prefer to encourage travellers to explore the local communities and benefit a larger number of locals by spreading their spending. This interaction and financial benefit gives an incentive to the wider community to conserve their heritage. We use local taxis because we like to support the local, rural economy. Our services are about authentic experiences, and cultural heritage is one large element of these. Travellers stay in the well preserved old part of Kakopetria village, a worthwhile experience by itself. The stone and mud-brick built old village has narrow alleys, old olive and grape presses and an old church. It is found between two streams that run year round providing coolness to the village during the hot season. Local cuisine is a living component of our cultural heritage, reflecting the intermixing of a number of civilisations that came to the island. We encourage visitors to try the local cuisine (including halloumi, the Cyprus cheese), because we consider it of high quality. We encourage travellers to visit at least one of the Unesco World Heritage sites on the route (they could relatively easily visit up to three) and possibly other attractions on the itinerary, such as watermills and other picturesque villages as it greatly enriches their experience and may also benefit the local communities.